One of the stranger off-campus locations for our class was 501 Ethel Street over in Home Park, the neighborhood bordering the north side of the Tech campus. For the most part the place was a mystery to me as I had only started learning to drink beer and had no interest in anything more exotic, which is pretty much what that house was all about. 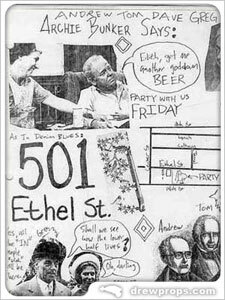 The only memory I have of the place was when one of the guys got hold of a copy of “Swimming to Cambodia” and Mance watched it so many times that he would walk around school reciting Spalding Gray’s monologue word for word, like the drunken fraternity brother he never was. He convinced me to come over and watch it twice in a row, which proved to pretty cool because in later years I would get to see Spalding perform two of his other monologues live; one in Kentucky and one in Atlanta.